Yesterday’s polling results out of Iowa were somewhat negative for Clinton with 66 percent of Democratic caucus goers concerned that the Clinton scandals could affect her in the general election. It gets far worse in two additional polls released today. After her temporary bounce after declaring her candidacy, Clinton’s favorability rating is again falling and more people consider her to be dishonest. 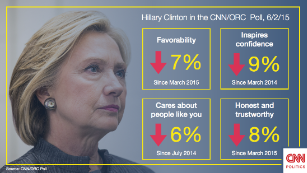 More people have an unfavorable view of Democratic front-runner Hillary Clinton now than at any time since 2001, according to a new CNN/ORC poll on the 2016 race. In general election match-ups, Clinton now runs about even with Rand Paul, Scott Walker and Marco Rubio, while she continues to top Bush and Ted Cruz by a significant margin. As noted above, those shifts stem largely from a change among independents, though Republicans appear to be solidifying their support for GOP candidates while Democrats are slightly less certain about Clinton. One feature of the race that has held even as the numbers shifted: These match-ups prompt enormous gender gaps. According to the poll, the gender gaps remain over 20 points in each of the five match-ups tested, including a whopping 34-point gender gap in Clinton’s match-up with Scott Walker. Her declining support in those general election match-ups, alongside falling favorability ratings and worsening impressions of her, suggests recent news about her actions as secretary of state may have taken a toll. Meanwhile, Hillary Rodham Clinton continues to dominate the Democratic nomination contest. But her personal attributes continue to erode in the wake of stories about fundraising practices at the Clinton Foundation and her use of a personal e-mail server while at the State Department. Clinton’s favorability rating has fallen steadily since she left the Obama administration in early 2013. Today, 45 percent see her positively while 49 percent see her negatively. That compares with ratings of 49 percent and 46 percent two months ago. Just 24 percent have a strongly favorable impression of her — down six points in the past two months — while 39 percent have a strongly unfavorable impression, up four points. The decline in Clinton’s ratings as a candidate who is honest and trustworthy highlights a likely vulnerability as a general-election candidate. Half of all Americans disapprove of the way she has handled questions about the Clinton Foundation, and 55 percent disapprove of how she has handled questions about her personal e-mails as secretary of state. Meanwhile, half also disapprove of the way she has dealt with questions about the attack on a U.S. diplomatic post in Benghazi, Libya, on Sept. 11, 2012, that resulted in the deaths of four Americans, including U.S. Ambassador J. Christopher Stevens. Majorities see the issues of the Clinton Foundation and Benghazi as fair game in the presidential election, while almost half of Americans say the e-mail issue is a legitimate topic. The most striking change in the head-to-head matchup between Clinton and Bush is a decline in Clinton’s support among women, from 59-36 percent in March to 49-43 percent now. Men continue to split, now 44-46 percent, Clinton-Bush. The shift among women is generational; it’s occurred almost exclusively among women younger than age 50 – from 72-22 percent two months ago to 48-43 percent now. It’s also happened to a lesser extent among college educated white women, a potentially important voting group: They supported Clinton 57-34 percent in March, but now divide evenly, 45-46 percent. Among other groups, Clinton’s gone from a 61-point margin among nonwhites, 78-17 percent, to a 47-point split, 70-23 percent; whites still break for Bush. A 48-43 percent Clinton-Bush split among independents in March is now 46-40 percent Bush-Clinton. And while more moderates support Clinton than Bush, 51-42 percent, that gap has declined from 24 to 9 points. Clinton continues to hold an enormous lead over Democratic challengers for the nomination, but there is still a long time until the Iowa caucus. With her favorability at a seven year low and Clinton no longer having a lead over the leading Republican candidates, it is looking increasingly foolish for Democrats to nominate a candidate who is both ethically unfit to be president and who is to the right of the party on most issues. This all might be taking a toll on contributions for Clinton. Politco reports that efforts by David Brock, who has been campaigning for Clinton with his groups Media Matters and American Bridge 21st Century Foundation, are not going well among some liberals. Note again that Brock’s organization Media Matters is closely aligned with the Clinton campaign, which explains much of the false information they have been posting to defend Clinton from media reports. Some of the liberal donors are finding Brock’s organizations to be acting too much like the Koch Brothers. Part of the reticence stems from liberal queasiness about the expanding role of big money in politics since the Supreme Court’s 2010 Citizens United decision. But there’s also some discomfort with Hillary Clinton, the former New York Senator and Secretary of State, who is seen as too hawkish on foreign policy and insufficiently progressive on key issues like fighting climate change, income inequality and the role of big money in politics. Additionally, Democratic finance operatives say, efforts to rustle up seven-figure checks are suffering from a lack of a single, unifying enemy on the right. It is certainly possible that David Brock could be successful in his attempts to win over more Democratic support for Clinton. His bogus talking points in response to the scandals have certainly been repeated by many Democrats, but fooling the big money donors might be more difficult than having his talking points spread on Facebook. Polls can, and probably will, change a lot between now and November 2016. However Democrats should be alarmed by the magnitude of the downward trend for Clinton, along with the danger that Clinton’s unethical behavior will harm her more as more people start paying attention to the facts. Republicans have a number of negatives of their own, but there is the danger that whoever survives the Republican race will come out of it in a stronger position than they are in now, and today’s tie very well could mean a Republican lead over Clinton by next year. Gambling on winning with a candidate the voters do not trust is foolhardy. It is time for Democrats who have been ignoring Clinton’s weaknesses and ethical transgressions to take their heads out of the sand if they want to prevent a President Rubio, Paul, or Walker from being inaugurated in 2017. Observers who follow every political twist and turn might imagine that opinions of Clinton would be hard to change, for good or bad, given that she has now been a top player on the national political stage for a quarter-century. The polling figures do not bear that out, however. An April Quinnipiac poll in three swing states — Colorado, Iowa and Virginia — showed the same weakness for Clinton on the honesty question, most conspicuously in Colorado, where a startling 56 percent of voters viewed Clinton as dishonest versus only 38 percent who saw her as honest. Posted in Hillary Clinton, Jeb Bush, Marco Rubio, Politics, Polls, Rand Paul, Scandals. Tags: Hillary Clinton, Jeb Bush, Marco Rubio, Rand Paul. RSS feed for comments on this post.. TrackBack URL. I'm noticing there was no mention of Bernie Sander's decision to enter the race having any effect on these polls, which is effecting her campaign. Can you explain? This post is on the national polls. Clinton still holds a strong lead over Sanders in this poll, but long term if Clinton looks weaker it certainly opens up the possibility of Democrats looking at other candidates. I looked at the Iowa poll and the increase in support for Sanders yesterday. Bernie has a nice new website. I made a contribution and signed up for lawn signs. More money and more effort will follow if he stays in long enough. I'm retired, now. It's not like I don't have the time.